Image from Don’t Break the Chain! I wrote for 30 minutes for 30 days, each and every day. Through some very generous donations, I raised $110 for Seattle’s Hugo House. I’m not gonna lie, the past week and a half were tough. We were traveling, there were work events, and then — icing on the cake — Byron and I both caught the cold from hell. Multiple days I thought, “I could just skip today. No one would know.” Except I would know, and I would feel guilty, so I sat down for the 30 minutes anyway. Maybe fever-dream writing will be the pinnacle of my book. 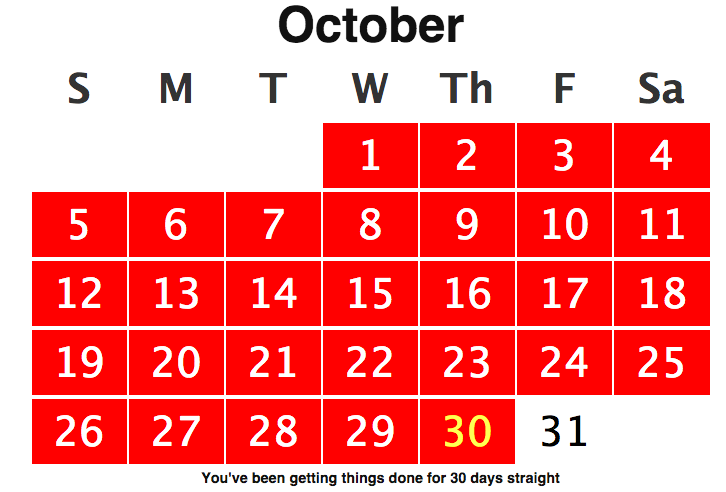 Still… in the past 30 days, I’ve edited 89 pages of my book (89 single-spaced pages, to boot). That’s a little over 45,000 words. That’s a hell of a lot more than I’ve gotten done in the past several months. All from just sitting down for 30 minutes a day. I’d like to keep this up. Habits are hard to make and easy to break, so I should keep it up. The lesson learned through this whole thing is that it’s entirely possible to prioritize your writing if you make it a priority. Keeping with the spirit of Seasonal, you could also do every other month. It would give you time to mentally rest and then pound it out the following month. Instead of dreading it or getting burnt out it could be the light at the end of the tunnel in either direction. Massively productive, with a side of rest and forgiveness. This is so sane and pragmatic it leaves me flabbergasted.